Flash emerged as the king of casual game development platforms in the early 2000’s. After 2 key stumbles (Apple iOS announces no Flash Player in iOS browsers) and industry-wide confusion about the ‘death of Flash’, Adobe is marketing furiously to offer value to developers and spread the word. Flash Player Running in the Apple iOS browser, is not possible. This is the ONLY segment where we saw a ‘death’ of Flash, so far. However, Flash-created apps in the iOS app store are possible, powerful, and popular. Flash Player Running in the Android browser, is possible on many devices. In my opinion, it will become less popular as HTML5 matures in the next few years. However, Flash-created apps in the iOS app store are possible, powerful, and popular. Flash Player Running in the PC computer browser, is popular on PC, Mac, & Linux. In my opinion, it will be continue to be popular. Flash content via the computer desktop (as ‘apps) is popular on PC, Mac, & Linux. In my opinion, it will be continue to be popular. Flash content via other devices (Smart TV’s and more) will continue to be popular. The most recent effort by Adobe to push its Flash Platform technology is Adobe Game Developer Tools, announced in December 2012. Here is a recap of the highlights. From Adobe: You have great ideas for cool games. Now, we’re providing you with the essential tools to rapidly build, optimize, and deliver your games to iOS, Android™, Windows®, and Mac OS. Adobe Flash Builder – Build amazing games and applications in ActionScript for Android, iOS, Windows and Mac OS X platforms using a single cross-platform development environment. Now with support for Adobe Scout. In my opinion, its best just for creating and animating assets. Adobe Gaming SDK – Adobe Flash Professional software is a powerful authoring environment for creating rich, engaging games and interactive content that reaches desktops, tablets, and smartphones with unparalleled consistency. In my opinion, its best just for coding and integrating existing assets. Create games faster. Reach over 1.3 billion people. – Only Adobe® Flash® Player and Adobe® AIR® let you deliver your game to 500 million iOS, Android, BlackBerry, Kindle Fire, and NOOK mobile devices and 99% of connected computers — with no additional install. One codebase. Use amazing tools and take advantage of simple, powerful APIs and frameworks enjoyed by a large and growing game developer community. In my opinion the cross-platform nature and existing community of developers are the most compelling reasons to use Flash Player & AIR. Cinematic graphics. Console-quality games. – The Flash runtime now delivers GPU accelerated graphics across browsers and mobile apps for 1000x faster, stunning 2D and 3D games. Craft amazing gameplay with native mouse, multi-touch, accelerometer, camera, and mic support. Code with human-friendly ActionScript®. Or take your C/C++ or Unity games and easily target the Flash runtime. Play beautifully. In my opinion, the quality of graphics & audio what Adobe now offers is first class. Make more money. And make more fun. – In my opinion, this is just marketing-speak. However there is a HUGE amount of existing Flash developers (i.e. better talent at lower costs) and the SDK’s exist to make your projects social and sales-friendly. What are Adobe Game Developer Tools? You have great ideas for cool games. Now, we’re providing you with the essential tools to rapidly build, optimize, and deliver your games to iOS, Android™, Windows®, and Mac OS. To get started, all you need to do is download the Adobe Game Developer Tools through a free Creative Cloud membership. If you already have a Creative Cloud membership, the Game Developer Tools are included! Adobe Gaming SDK – The Adobe Gaming SDK gives you a complete collection of frameworks, code samples, and learning resources that work together to help you accelerate your productivity. Flash C++ Compiler – Cross compile C/C++ to run your game in Flash Player with GPU acceleration. Deliver your back catalog of games to target 1.3 billion connected desktops. 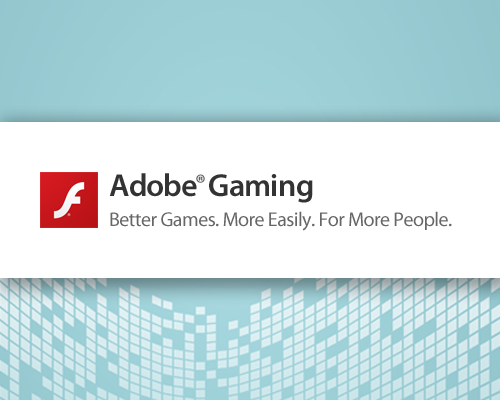 Adobe is now attracting non-Flash game development companies. For that market the AGDT is a well-marketed introduction to Flash. Newbies can hit the ground running; (theoretically) using any legacy C++ code, getting started with the frameworks in the SDK, and doing powerful profiling with Scout. For existing Flash developers perhaps none of this is interesting. There are many Flash experts who use no C++, who already have access to the frameworks in the SDK. Scout is very powerful, and indeed is worth the (unannounced) price of entry. But not every game developer profiles his or her projects or knows the great value in doing so. However, I do think that Adobe’s increasing powerful set of tools, and energized game-specific marketing will help focus the game industry on Adobe’s tools, and too, Adobe-centric game developers. That is great. See a HUGE showcase of Flash Games for Browser/Desktop/iOS/Android/More. We at RMC are excited to collaborate with you. We are experts in Flash Platform Gaming, and more. Not sure if HTML5, Unity, or Flash is right for your next project? Just ask! Very good Site, Stick to the good job. With thanks!. Thank you! This a awesome web page!. It is actually truly a great and useful component of info. I’m happy that you shared this helpful information around. Please stay us updated this way. Thank you for sharing. make your web site mobile friendly? My weblog looks weird when browsing from my iphone 4. Very good Webpage, Preserve the wonderful work. With thanks!. Thank you for sharing your good site.